Detection, Recognition, and Identification (DRI) are terms used to compare the performance of thermal infrared cameras. This paper explains these standards that have been set in place by The Night Vision Thermal Imaging Systems Performance Model. This model, also referred to as the Johnson criteria, is the universal standard for measuring thermal cameras. Download the PDF version of this whitepaper. 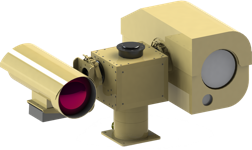 DRI is a universally accepted set of standards that provides a means of measuring the distance at which a thermal sensor can produce an image of a specific target. These standards were initially developed by the US Army and take into consideration many different criterion such as noise, array size, optical blur, lens depletion, aperture, atmospheric depletion, detector pitch and many more. It is important to read all of the following definitions, as they are not always what people expect when they see these words. Detection refers to the distance at which a target initially appears in the image. This “target” is something out of the ordinary that is warmer or cooler than the ambient environment. Specifically, it will be visible on at least two pixels, so there will not be enough information to confirm what the target is at this distance. Contrary to common use, recognition does not mean that you can recognize an individual. Recognition refers to the distance at which you can determine an object’s class (is it a human or a car, a truck or a tank, etc). Identification refers to the distance at which you can differentiate between objects within a class. For example, identifying the type of vehicle (truck, SUV, or car) or whether the human is a soldier or civilian. Note that these measurements do not take many atmospheric conditions into consideration. Weather is almost never ideal so in reality these distances are usually reduced. As you can see, the terms detection, recognition, and identification can be misleading, especially to end users without a military or electro-optics background. To make matters worse, the original 1950s specifications were based on much older screen display technologies. While the standards have been updated from line pairs to pixels in an effort to modernize them, the increasing resolution of thermal sensors has shrunk the size of the DRI areas in relation to the overall field of view. For example, our high-res uncooled thermal sensors have a resolution of 640×480, which is over 300,000 pixels. Human “detection” only requires 3.6 of those pixels and “identification” only requires 230 pixels. This is an extraordinarily small portion of the screen that can easily go unnoticed by the human eye. Even when magnified, the amount of detail visible at the DRI distances is not as high as one might expect, as seen in the chart below. Another often overlooked aspect is that these ratings are based on “ideal conditions” which rarely happen in the real world. In reality, the average application will get 25% less than the rated distance and in extreme conditions can be 90% less. We wrote this white paper to give end users the ability to understand the actual performance they can expect from their thermal cameras. In addition to thermal imaging, Infiniti also offers active IR, SWIR, and visible sensors. We do not limit our customers to any one technology; rather we custom build solutions that use multiple sensors depending on the project. Contact us today for expert advice on the ideal solution for you.